Hélène Clément is already well known to NNMF audiences as the violist of the Doric String Quartet. 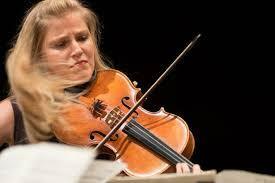 She returns this year as a soloist, in company with pianist Tim Horton and fellow violist Simon Rowland-Jones. Their programme includes two elegiac pieces by Britten, separated by two contrasting works by Bridge, and the Wiegenlied Variations composed by Simon Rowland-Jones, all three of these composers violists! Simon edited and completed the two Bridge viola duets from the composer’s incomplete original sketches. Enchanting arrangements of two movements from Prokofiev’s ballet Romeo and Juliet for two violas and piano complete their performance.